GETCHER RED HOT SPACE OPERA STORYBUNDLE NOW! Curated by the Science Fiction and Fantasy Writers of America, the Space Opera Storybundle features 18 novels of space adventure, by authors such as Stephanie Bedwell-Grime/,/ //Mike Shepherd, Jennifer Foehner Wells, Don Sakers, Vera Nazarian, Terry Mixon, Lee and Miller, and more! This opportunity ends on May 31, so now is the moment to act! Release the Virgins is an original anthology built around the phrase — wait for it — “Release the virgins.” No, we don’t know why. But! It sounded like fun and Steve agreed to do a story; then Sharon agreed to do a story, too, joining a host of other writers with a playful streak, including Jody Lynn Nye, David Gerrold, Cecelia Tan, Lawrence Watt-Evans, Shariann Lewitt — and more! The campaign runs until June 17. 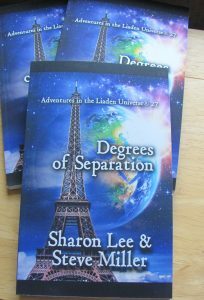 Degrees of Separation paperback now available! As the above statement strongly implies, you may now order the paper edition of Degrees of Separation: Adventures in the Liaden Universe® Number 27, from Amazon only. The ebook edition of Degrees. . . continues to be available for pre-order from these vendors: Amazon , BN, iBooks, Kobo, and Tolino. On January 15 (that’s Monday!) the ebook will go “on sale” at the above stores, and also at Baen ebooks.